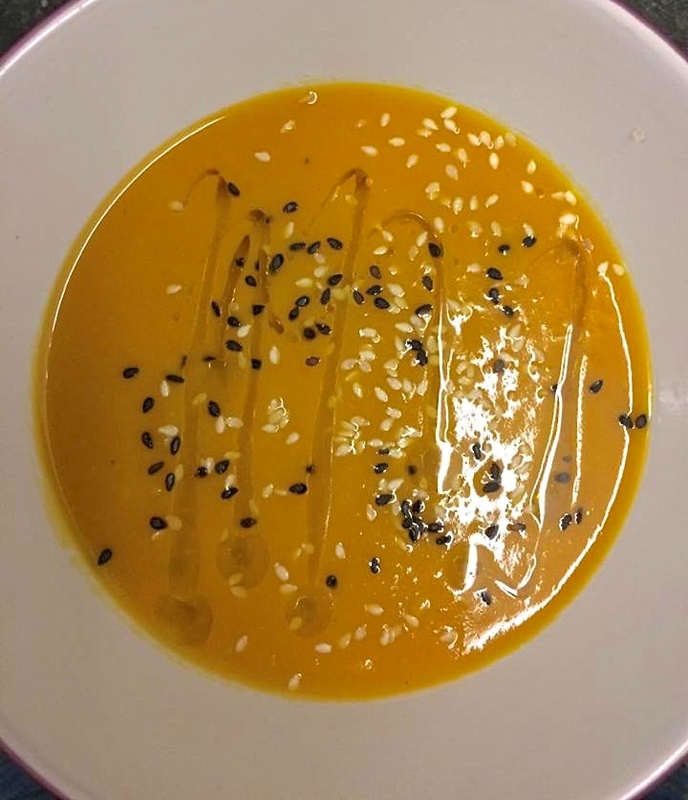 Pumpkin always makes the silkiest soups and is a great autumnal ingredient, however if you can’t find pumpkin then any other kind of squash also works well here. I really enjoyed making this soup as it’s really easy as well as making ordinary winter veg a little more interesting by incorporating Thai flavours. Add the oil to a large saucepan and heat until shimmering on medium. Finley chop the onion and add to the pan, after a couple of minutes finely chop the ginger, garlic and chilli and add to the pan. Fry until soft. While the onion, garlic, chilli and ginger are frying, peel and chop the pumpkin into 2cm chunks then add to the pan. Lightly fry then add the coconut milk and stock and stir to combine. Cook on medium with the lid on the saucepan for about 25 minutes or until the pumpkin is really soft. Use a stick blender to blend the soup and make it silky smooth, then season. I’ve served mine with a drizzle of olive oil and some black and white sesame seeds, but use whichever toppings you prefer! Toasted pumpkin seeds and crushed chillis would also work well.